Mopubi is an affiliate network that is specialized in pay-for-performance results and providing high-quality marketing services. The company reaches 900 million users audience reached every month and more than 60k orders monthly. Mopubi is aiming to design a platform in order to connect excellent products with global customers in this mobile era. Their team of marketing specialists will deliver the best marketing products for the brands. 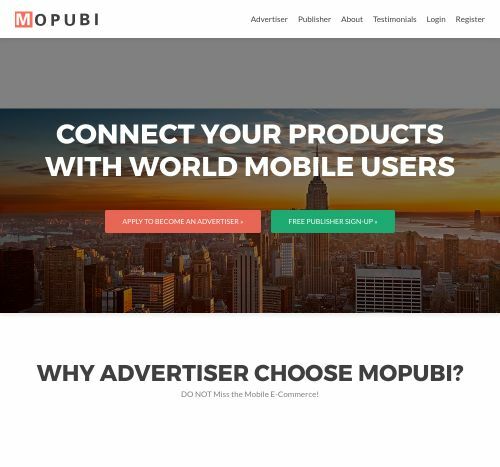 With more than 3 million of app installs monthly, Mopubi has proved to be a popular advertising company and one of the favorites when it comes to newcomers. Check the reviews on Affbank about Mopubi and for any details regarding their Target Audience, Pricing Models and Advertising Formats, reach the Information section. If you choose to join the Mopubi Network, you can do that by clicking on - Join Now! Once you create an account, you will get in touch with an experienced Manager who will give the best to help you reach your goals with Mopubi.